Our true passion is to complete every commercial seal coating, striping, paving and asphalt repair on-time and on-budget! Over the last 50 years, our Orlando and Chicago area customers have come to expect outstanding customer service while receiving the highest quality product. At Miller, the majority of our customers are repeat or referral customers from a job well done. We take deep pride in our work and enjoy earning the trust and confidence of our customers on every project. Our quality comes from firmly making the decision to provide the best possible products and service at the best value in our trading areas. When making asphalt repairs, we don’t skim patch ever. We remove and replace. Our sealer is premixed at the factory and there is never any water added. These are just a few of the factors we feel differentiate us and have kept us excelling in the seal coating and asphalt repair business for many years. It is more important than ever to protect your parking lot and driveway investments! 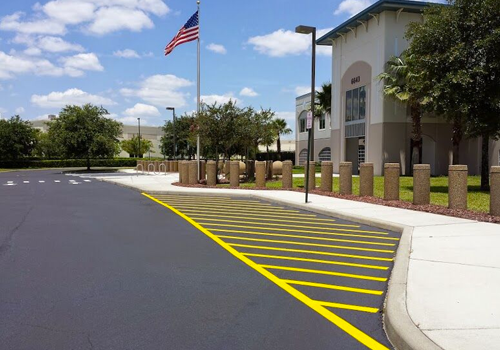 Using the highest quality seal coating and asphalt products, we help our customers cut costs and maintain their parking lots more efficiently. Miller Seal Coating can help you beautify and prolong the life of your parking lot(s). Contact Us if you’d like a Free Estimate as we look forward to the possibility of earning your business.